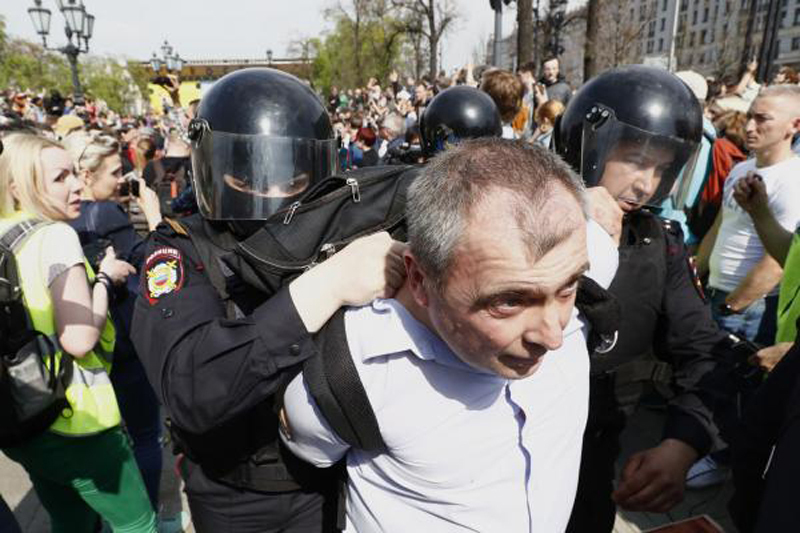 Russian opposition leader Alexei Navalny was arrested Saturday during a protest against President Vladimir Putin in at Pushkinskaya Square in Moscow. Navalny, who organized the protest in Moscow and in several other cities in Russia, was arrested shortly after arriving at the event for illegal protest organization. Russian officials, who require applications be filed and approved for rallies, did not issue a permit to Navalny for the protest in Pushkinskaya Square. The Navalny campaign was offered another location away from the city center but did not use that location. The rallies were in protest of Putin's inauguration Monday. The president, who won his fourth term with almost 77 percent of the votes, has been in power since 2000. Navalny, 41, was barred from entering the race because he carries a fraud conviction, something he says is politically motivated just to keep him off the ballot. He was one of more than 1,600 people that police detained during the protests. Protesters chanted "shame" and "Putin is a thief" while marching through the capital city, carrying placards or Russian flags. Pro-Putin supporters also turned up, leading to scuffles between the two groups.